Linguaskill is an online, adaptative, multi-level test designed to help organisations assess groups of candidates. It offers a complete picture of your candidates' English abilities, with fast and accurate testing of all four language skills: reading, listening, writing, and speaking. It provides detailed results and clear individual and group reports. Linguaskill can be easily administered and invigilated at your own venue at a time that suits you. All you need is a computer, an internet connection, a microphone and a set of headphones. Important: BULATS will be retired as of December 2019 and will be replaced by Linguaskill Business. Administer the test onsite using just a computer, internet connection, a microphone and a set of headphones. No specialist software or equipment is needed (check technical requirements). The Reading and Listening module is adaptive, so there is not a fixed number of questions. Each question the candidate answers helps the computer to understand their level better. The test finishes when the candidate has answered enough questions for Linguaskill to identify their level accurately. Results for the Reading and Listening module are provided immediately. The Writing module asks candidates to input answers using a computer keyboard. Answers are marked automatically by the computer. Results will be available within 48 hours. Reading aloud: The candidate reads eight sentences aloud. Long turn 1: The candidate is given a topic to talk about for one minute. 40 seconds are allowed for preparation. Long turn 2: The candidate is given one or more graphics (such as a diagram or information sheet) to talk about for one minute. One minute is allowed for preparation. Communication activity: The candidate gives their opinions in the form of short responses to five questions related to one topic. One minute is allowed for preparation. Linguaskill assesses English language ability from below A1 to C1 or above on the Common European Framework of Reference for Languages (CEFR). 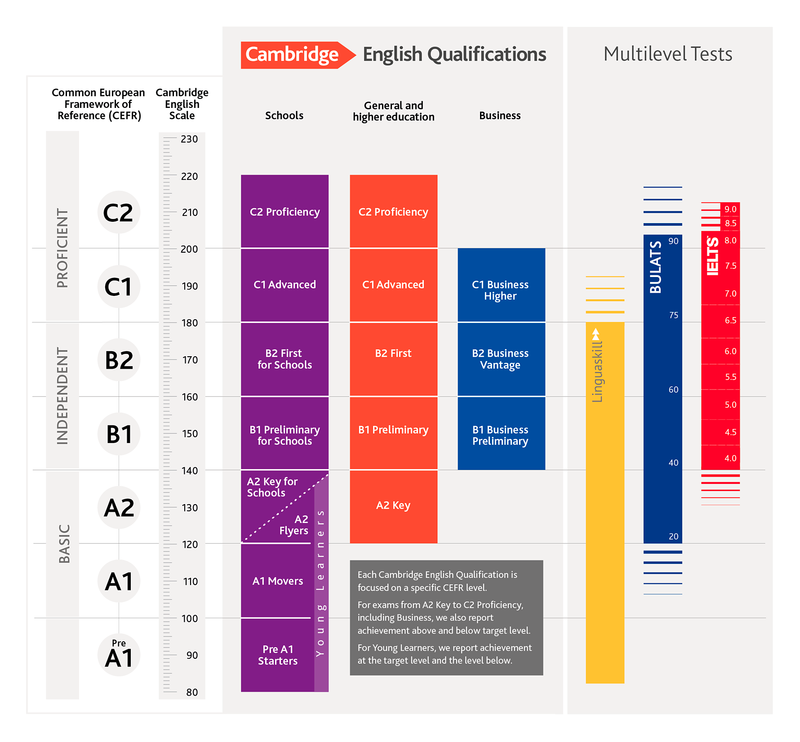 Test results also show Cambridge English Scale scores.You'll see a Cambridge English Scale score and CEFR Level for each skill tested so you can see where test takers have performed well, and where they can improve. Use our online search to find a Linguaskill exam date.